So many people told me that it would change my life forever. They told me I would be hooked, and I would immediately want to do more. That crossing that finish line would be the beginning of something amazing, not the end. They were right. Somewhat hard to tell, but the hubs and I crossed hand-in-hand! I can now call myself a marathoner, and to say it has changed me would be an understatement. It’s been an emotional, time-intensive, not always pretty roller coaster ride. The amount of training, cross-training, food and time that went into this one day is almost comical to think of now. Did I mention food? Was it worth it? Ten thousand times yes. To say I was lucky would be 100% accurate. To say I was well prepared would also be absolutely true. May 15th was the combination of both elements: a solid training plan and preparation, perfect weather conditions, ideal speed and pacing, incredible support before, during and after the race (both on and along the course), a wonderful and exciting home-town course, and the list goes on. 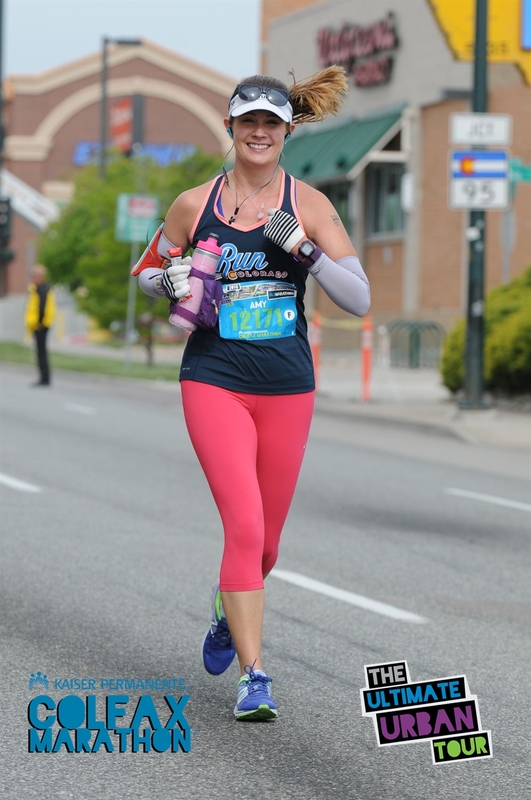 The 2016 Colfax Marathon, for me, was the perfect race. I know there are a lot of factors outside my control on race day. As runners, we know that every run is different and you absolutely cannot predict how you will feel throughout the race. I have thanked my lucky stars over and over again that I felt great, set a great pace that I was able to maintain for almost the entire race, and I experienced no real pain. Occassional discomfort is a given when pounding the pavement for over 26 miles, but I am grateful for no pain. The week leading up to the race was amazing. I got in some last great miles, focused on toning and strengthening through Core Power Yoga Sculpt and Tone It Up workouts, tried to get more sleep and stayed on track with a good diet. The nerves definitely set in throughout the week, and by Friday it was all I could think about. 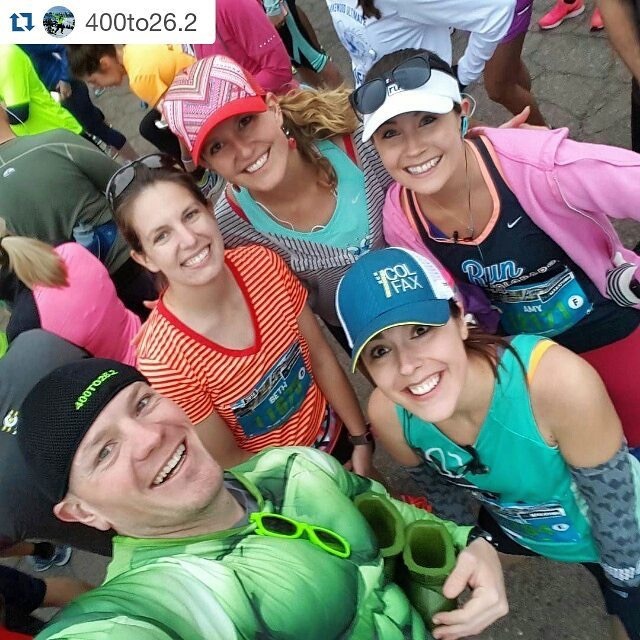 Inspiring women and great friends make packet pickup even better! to the Health and Fitness Expo, housed at none other than Mile High Stadium!! I met up with a few amazing Oiselle ladies whom I met through Instrgram to comemorate the event. Their first marathon experience was the Colfax Marathon in 2015, so they have been amazing guides and friends to me throughout this process. I’d never been inside the stadium until that day, and the expo was located on the United Club Level. Walking through the expo felt like a dream. I sampled some awesome items from Clif, purchased a Colfax Marathon hat and half-zip, and claimed mine and the hub’s bibs and tech shirts. SO delicious, and just around the corner from Mile High. 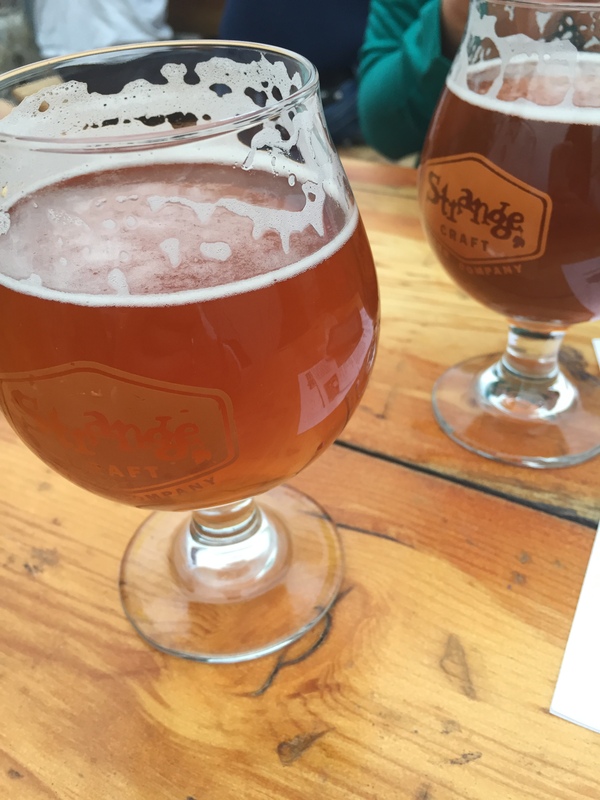 After the expo, we of course took some epic photos outside the stadium, and then meandered over to Strange Brewing Company for a couple of celebratory beers. The Grapefruit IPA is absolutely delicious and I highly recommend it. This was just what I needed to calm some of my nerves, before heading off to Patxi’s for a delicious whole wheat salsiccia pizza and a glass of Meiomi. I am so lucky to have been able to surround myself with such an incredible group of runners! the highly recommended “Spirit of the Marathon” documentary, which follows the training journey of 6 inspiring athletes as they prepare for the Chicago Marathon. What I loved most is that the documentary focused on both elite athletes as well as regular runners of all ages, races, backgrounds, and experiences. Talk about a major motivator. If you haven’t watched this before a race, it’s a complete must-do. I spent the afternoon doing a few quick errands, and then I met up with an incredible group of runners for a delicious dinner at Firenze a Tavola in the Highlands. The Pappardelle con Cinghiale with their homemade pasta and wild boar ragu was to die for, and made for the perfect carbo-load pre-race dinner. Race day started at 3:45am for my morning wake-up call. I was able to sleep fairly well the evening prior, in spite of some seriously weird dreams (broken legs… yikes!). I had everything ready to go: my outfit, my water bottle and accoutrements, my shoes, my throw-away, and our gear check bag. The hubs and I awoke and assembled our items with groggy acceptance, and left the house at 4:35am. Thankfully we live about 15 minutes south of the starting point at City Park, and could park easily on the south side of Colfax so as not to be caught up in the road closures. Thanks Gary for such a great shot, and being an expert selfie-taker! We waited in the car for about 15 minutes before making the 15 minute trek to the northeast corner of City Park, near the Nature and Science Museum. 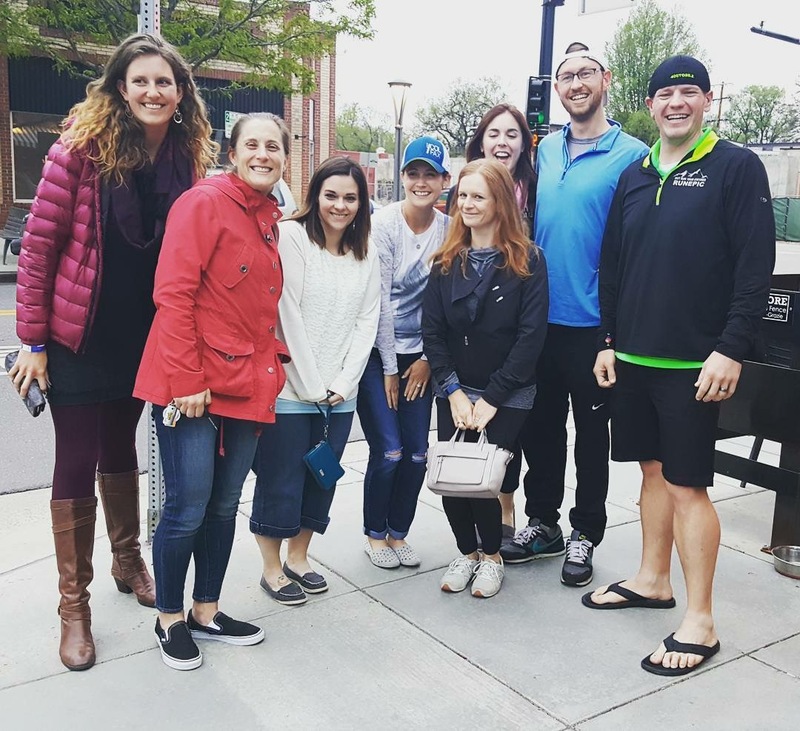 We dropped off our gear check bag and met up with one of my runspirations and some of her incredible running friends, with whom I am thrilled to have had the opportunity to meet. We were in corral F this year, so it didn’t take too much longer after the first wave to set off. Oddly at that moment I felt incredibly comfortable and sure of my journey. I knew the destination, and all that was between me and victory was 26.2 miles. Over the past 18 weeks I had put in over 400 miles, so this was just a drop in the bucket. I started off feeling great, though quickly realized a bathroom break would be in my near future. I’d been very determined to hydrate all morning, but the nervous bladder wasn’t feeling that. So at mile 2 I dashed to the porta potties for the quickest bathroom break of my life while the hubs traversed onward. 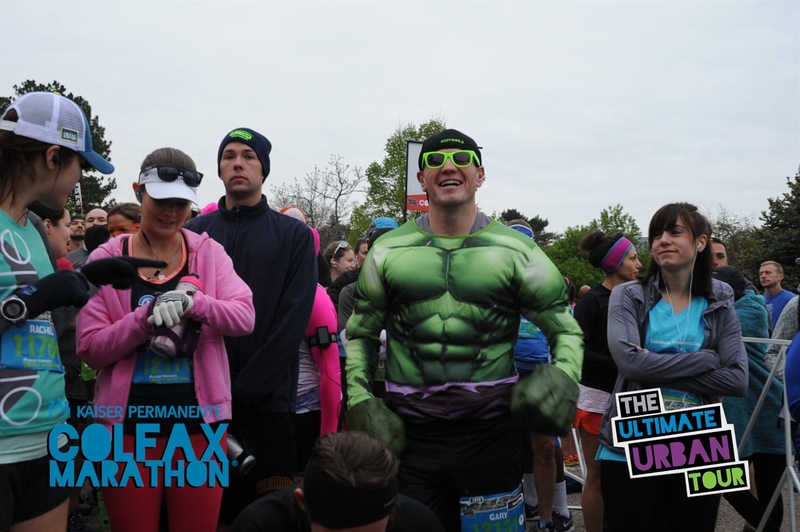 So focused at the starting line up – Gary (aka the Hulk) was ready to go!! The first 10K took us out of City Park and onto Colfax up until Speer Boulevard, at which point we ran through the firehouse and made our way onto the Cherry Creek Trail. At the base of the trail I experienced my first sighting with my best friend Tessa and her roommate and equally amazing friend Kristin. Kristin, I should mention, is a beast and a HUGE source of inspiration for me. She has run Boston twice and is a truly an incredible runner, and person. Seeing Tessa and Kristin there cheering me and all the other runners on at 6:30am meant the WORLD to me. After passing them I definitely teared up with love and excitement. This section of the first 10K took us along the Cherry Creek and Platte River, and is my weekly training path. It felt like home, and was just the boost I needed. A little familiarity can go a long way. Tessa and Kristin biked down the other side of the trail to meet us again as we turned left from Cherry Creek to the Platte River. Best cheering squad EVER. After passing Elitch Gardens theme park, we turned left towards the Broncos Stadium at Mile High. 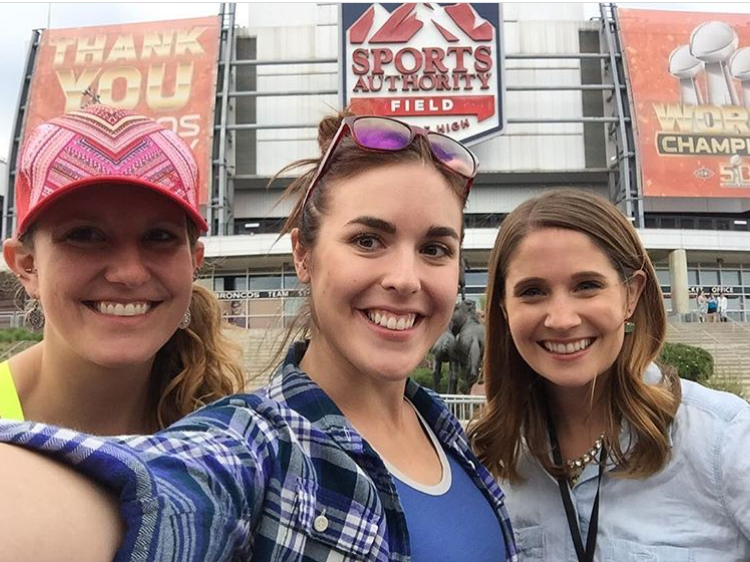 Running through major sports stadiums might be my favorite thing ever (um, hello Homerun for the Homeless 5K and Bolder Boulder 10K), and is just such an amazing feeling. After this point we ran out of the stadium, wrapped around the parking lot, and turned right onto Colfax again (appropriately named marathon, I think). This section was up-hill, but I was still feeling great so I kept on running. We eventually turned right to head towards Sloane’s lake, a great trail surrounding the lake on the edge of the Highlands. The west side of the lake has a perfect vista of the Denver skyline, which I first experienced my first year running the Rock ‘N’ Roll Denver Half Marathon in 2014. Around the lake they had the Chinese Dragon dancers performing for the runners. Tessa and Kristin popped up yet again, and it was at this point I started pacing Jared, a dentist from Florida who is also a Denver transplant. He and I ran together for quite a while, so we chatted it up. After returning to Colfax for a short stint, we entered into Lakewood and again turned right to run through the Rocky Mountain School of Art campus and some Lakewood neighborhoods. Some hills reared their ugly heads, but thankfully Tessa and Kristin appeared just in time! At about mile 14 Jared and I parted ways so I could run up the hill into the quaint Lakewood suburbs. I walked for a bit to partake in my Vanilla Bean GU, and heard my name by a passing runner. My friend Dana was running the relay, which tracks the same course as the marathon. I was able to catch up with her for a short time and chat about her recent engagement and puppy, before dashing off as we turned east on Colfax. The next section from mile 16 through 19 was spent fairly solitary but completely peaceful. The city was just beginning to wake up and there were plenty of people cheering along the sides of Colfax. And thankfully this entire section is downhill! Little victories. I flew down Colfax in a blur, and turned back towards Broncos Stadium. Prior to running into the stadium, the race team errected an actual wall just prior to mile 20 that you can literally hit. Needless to say I did just that, and can thankfully say I didn’t hit any figurative walls the entire run. Yeah, I was really happy… I couldn’t stop smiling! Sam and I running through Mile High! Finally we reentered Mile High, and it was here I met Sam, who was running his first marathon in 24 years. He and I ran together through the stadium, and after exiting Tessa and Kristin greeted us one more time (THEY ARE THE BEST). We turned back onto the Platte River trail and chatted about our motivations and what gets us through. His daughter was graduating that day, and he had determined to run Colfax for her. After departing the Cherry Creek trail, Sam and I separated and I ran onwards up Lawrence Street to then make the final major turn onto 17th street. This would essentially take us back to City Park, where the finish line awaited. After crossing Broadway, 17th boasts quite a nice hill. I ran up half, walked the rest, and then kept on running. Honestly I could walk the hill faster than I could run it, and it was a fantastic stretch for the hammies. By this time I had less than a 5k left to go. I began looking around at the people left around me, a mixture of the Urban 10 milers, relay participants, and the determined marathoners. Suddenly I looked to the right and there was the hubs! I arrived at the right time for us both, and we were able to finish those last few miles together. This, for us both, was perfection. Coming into City Park, I heard a shoutout and turned around to see my friend Perri, Dana’s sister, a transplant from the East Coast like me! 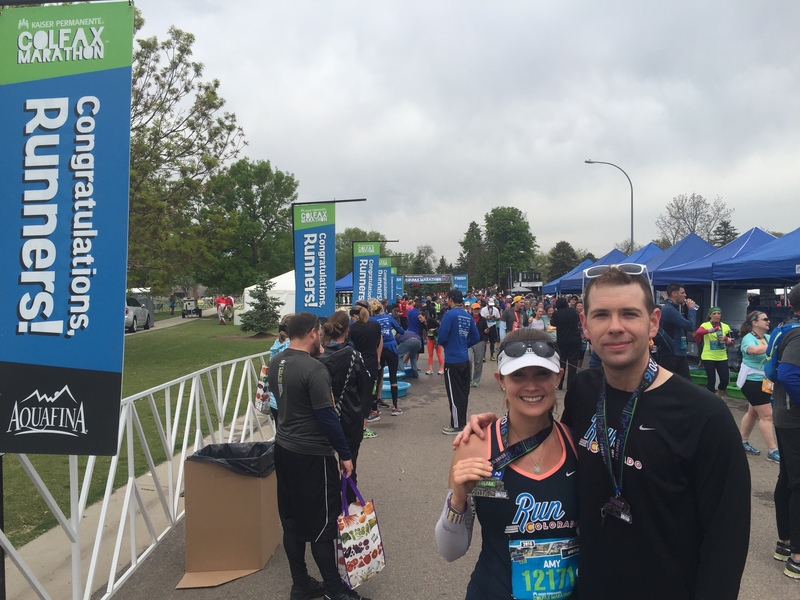 She had finished the half marathon like a champ and gave me the last boost I needed. After turning a corner, Kristin showed up one more time on her bike, and just ahead was the finish!! Crossing that finish line was one of the best moments of my life. Immediately a rush of emotion fell over me. I had never before had such an incredible race experience. I had never run this far in my life. And better still, I was able to cross the finish line with my best friend and love of my life. The culmination of thoughts, emotions and knowledge of success made all of the miles, all of the struggle and self doubt, and all of the times I wanted to quite worthwhile. Throughout my journey, my girlfriends from the east coast continued to text me and virtually cheer me on. They were all tracking my time and sending me words of love and excitement. My family, too, texted me with notes of encouragement. The support I received throughout this entire process is undeniable and something I don’t think I will ever fully be able to express. When I think about what got me through, it was because of the love and dedication from each and every one of them. 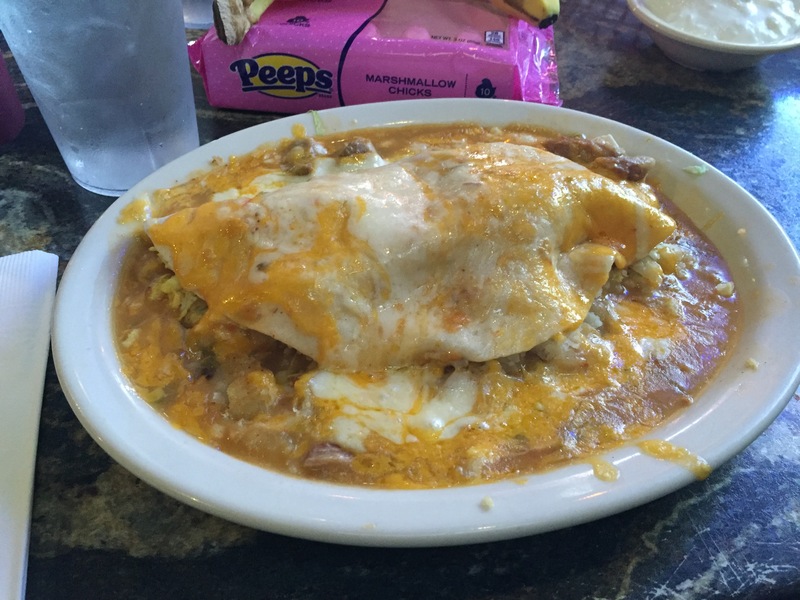 Green chili smothered burrito… mmmmmm…. also became a major thorn in my side. I had, however, been imagining for months my first meal post marathon. I really wasn’t sure how I would feel once I was done. I definitely was looking forward to food, but wasn’t voracious either. After we picked up our drop bag, Robbie and I slowly moved towards our car. Tessa and Kristin met us at Benny’s, our favorite local Tex Mex restaurant in Governor’s Park. To say I ordered a burrito bigger than my face might be an understatement. The sad part is that I have CRUSHED this burrito in the past, but that day, I was only destined for three quarters of it. Oh well, it was delicious all the same. After we drove home, the hubs and I got cleaned up and promptly passed out on the couch. The day ended with some incredible Cuban food, and an early bed time. Recovery over the next few days was actually easier than I had imagined. By Tuesday I was completely back to normal and actually went for a short jog on Wednesday. Since then I have participated in the BolderBoulder 10K, the Liberty Run 4 Miler, and the Sand Creek Half Marathon and still feel amazing. Is another marathon in my future? Absolutely!! I am just not sure which one yet…. Motivation Mantra: Do it for Disney!